My yearly status report is below. We endeavor to keep our community updated as to our priorities and strategies. Thank you for your continued support of DHS. Click HERE or scroll below to Read the President's Status Report. Thank you for being an important member of our Duchesne High School community. Your support truly makes a difference. Our team is working to make a difference as well. Following is our 2017-2018 President’s Status Report, which provides an update on our projects and successes. Thank you for your time and interest! Please let me know if you have questions or would like any further information. Our first priority in the Advancement Office continues to be enrollment. We experienced an enrollment jump last year with a large number of Kennedy transfers. A majority of those transfers were seniors and have graduated. For the 2018-19 school year we have budgeted for 305 students. At this writing we have 317 students, with a freshman class of 93 students. This is a 55% increase over the incoming class of 60 from three years ago. This small senior class in the 60s will be graduating in May 2019, which gives us an opportunity to increase enrollment for the following year. We continue our Alumni Pioneer Prayer Fridays, giving alums the opportunity to say prayer and share a little bit l about their memories as well as present careers and activities. What a wonderful way to involve our alumni in the mission of their school. Our alumni events continue to expand. 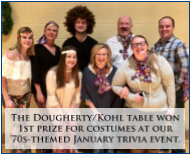 We had two trivia nights this past year, in August and January. Both were very successful. Funds from the August event went to tuition assistance, and funds from the January trivia night went to the new House System. Our 5K was enjoyed by all participants, and we attempted a sand volleyball tournament in June but did not get enough registrants and had to cancel the tournament. We will continue to try new ideas to involve our alumni. This year, in addition to our trivia nights and Pioneer 5K run/walk, we will be attempting a new event for alumni and friends: a New Year’s Eve dance. Our Alumni Association Board has been reconstituted, and we are still looking for class captains from each graduating class. Please let me know if you can help us communicate with your class in this capacity. Our golf tournament had a record-breaking year last year, netting $11,000. Our next golf tournament is scheduled for Friday, October 5, 2018, at the Falls Golf Course in O'Fallon, MO. Honestly, we really could not have fit another person in our gym for this annual event in November! 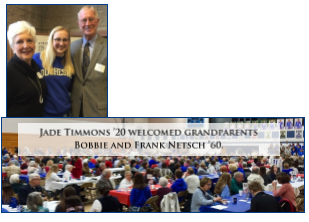 What a fantastic showing of support for and by our beloved grandparents. This year our Cor Duchesne dinner became a revenue producer with a net of close to $3,000. This was because of free-will donations and an anonymous donor covering the bar. If you did not attend this year’s auction, you missed quite a party. Once again Chris Nagus ’96 of KMOV Channel 4 News was our celebrity auctioneer and Jack Borgmeyer ’97 was our emcee. Our Fund-a-Need for tuition assistance netted $49,230, over $11,000 more than last year’s Fund-a-Need for the gym floor renovation. Our grand total for the auction, including the Fund-a-Need, was $112,106. I don’t sing often (sometimes at graduations), but I couldn’t hold back this year and sang a few bars from the Pointer Sisters’ song, “I’m So Excited!” to celebrate the fact that we sold out the Dream Home Raffle!!! Twenty-three years ago I brought this fundraiser to Duchesne. It has generated millions of dollars of non-tuition income since then. But this is the first year we have sold out!!! Our net this year for the Dream Home Raffle was $174,077. This is $52,077 over last year’s net, and in two years we have increased the net of this fundraiser by $106,000. A few days later, we received word that Roger Orf ’70 was making an additional donation in the amount of $32,000 so that we could get the $10,000 from our challenge donor. THANK YOU, ROGER!! — and thank you to all of our donors to this fund! Additional appreciation goes out to Russ ’85 and Amy (Kelly) ’85 Phillips for all their work on this project. Our Ron Kjar Service and Scholarship Award endowment is now $100,000 larger! 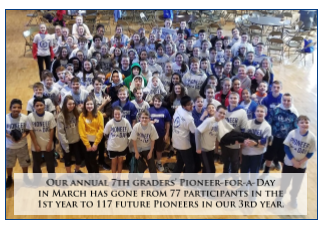 I always make a point of calling our Pioneer Fund the annual fund. When we just call it the Pioneer Fund our donors are confused with the nature of the fund and its purpose. This fund is critical to the day-to-day operations of Duchesne. Our tuition is $10,500, but our actual cost to educate is $13,929 per student. The annual Pioneer Fund gives parents and the rest of our donor community a chance to give tax-deductible gifts of non-tuition income to our school. It also gives our wider community the opportunity to aid the school annually. This year, we worked with Partners in Mission to segment our donor database. I personally called all parents to ask them to donate to this very important fund. Our faculty and staff showed 100% participation in the annual fund. Our parent participation was 25%, which we hope to improve. Our fiscal year ended with $123,500 in gifts to the annual Pioneer Fund, which is a $37,000 increase over last year. At this writing, we have sent out 27 invitations to people in the Duchesne community to join an Advancement Council for Duchesne. The Advancement team and I need help in raising non-tuition income for the school. This council will be different from the Advisory Board. You have heard me say before that our destiny as an institution is up to us. There will be no additional help from the Archdiocese. The support we receive from the ACA, from the parish cathedraticum that flows through the Catholic Education and Formation Office, from some Beyond Sunday awards, and from other endowments are all appreciated. But the fact is that Archdiocesan support of Duchesne as a percentage of expenses has steadily declined in the past 30 years. The demographics of our population has also changed in the past 30 years. More and more of our parents need financial aid. It is very heart rending for me to meet with parents, who, through no fault of their own, are struggling with job loss, health issues, and difficult financial situations, yet still want a top notch, Catholic education for their teenager. The Advancement Council will help with individual outreach and the establishment of a Business Alliance program for support of the institution. Carpet tiles were laid in Strauss Hall. Gym railings and metal areas on the steps were painted. The tennis bleachers were converted to aluminum seats and backs, along with two other wood bleachers for the athletic field. The green room for the drama classes and productions was given a new coat of paint. The gym floor was professionally screened and given a new coat of finish. At this writing, plans are proceeding for the renovation of the main office. As we move forward, similar renovations of classrooms will need to occur on a gradual basis. Floors, furniture, and possibly lighting will need to be updated. We don’t want alumni who graduated in the '80s coming for a visit and saying, “That room looks exactly like when I was here.” We are somewhat limited with the exterior of the building, but we will do what we can. The interior classrooms, where students live, definitely need upgrading. Much planning work has occurred for our new House System that is being launched in the 2018-2019 school year. Students will be divided into four houses. Our House System will make the transition to high school easier by providing a sense of belonging in a small community across all levels, interests, and activities. 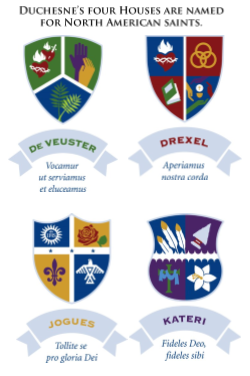 The House System will enable us to more efficiently fulfill the mission of Duchesne by developing leadership skills, mentoring all students, and building a stronger sense of community. Students enter a homeroom (communio) and a house as freshmen and stay with that communio and house throughout their high school experience. This system allows freshmen to be mentored by seniors and then to grow to become mentors themselves. This idea came from our teachers, so it really is a grassroots undertaking. The students are very excited about this new system and have been instrumental in its development. Our House System is just another example of Duchesne striving to do what is best for students and teachers. With our excellent AdvancEd evaluation this year, our faculty and staff, and our wonderful parents and students, Duchesne is poised for success in the coming years. 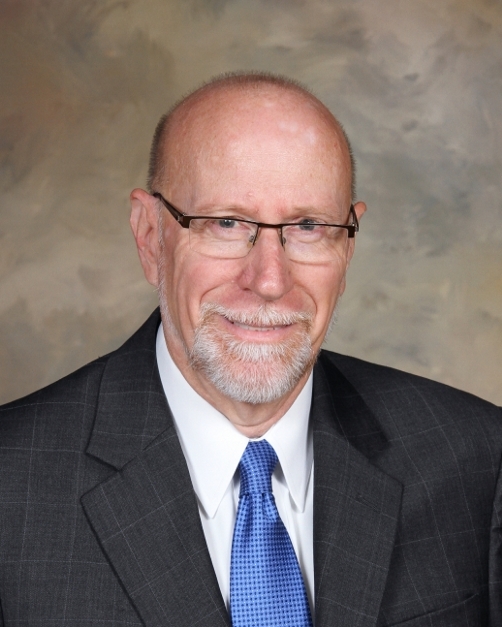 I salute our principal Fritz Long and our faculty and staff for continuing to pursue excellence. I thank our Advisory Board and all our countless donors for your support. Again, it is with humble gratitude that I express my joy at being Duchesne’s president. I ask you to keep me and all the Duchesne community in your prayers. Let us not let the darkness of the world extinguish the beacon of Christ’s light that is Duchesne. We are Duchesne!